Pascal is a procedural programming language designed and developed by Niklaus who is a French mathematician and philosopher Blaise Pascal. It was founded in 1970. 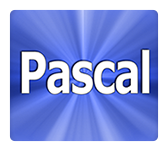 Pascal supports multiple platforms like Windows, Mac OS, and various versions of UNIX/Linux. This tutorial explains the basic concepts of Pascal to work on Delphi and other related frameworks etc. This tutorial is mainly built for software Professionals who seeks to learn Pascal Programming Language in easy and simple steps. This tutorial provides basic knowledge about Pascal Programming concepts. To learn this tutorial you need to have minimum understanding of software basic concepts like source code, compiler, text editor and execution of programs, etc. It will be an added advantage if you have learned any other programming course.